Celebrate your independent spirit this July 4th with some high energy antics from some of the coolest guys in music! 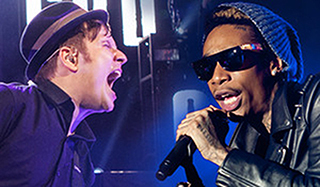 Pioneers of pop punk Fall Out Boy team up with MC extraordinaire Wiz Khalifa for the hotly anticipated Boys of Zummer Tour, and they're coming to Pavilion at Montage Mountain! With support from hot hip hopper Hoodie Allen, this is going to be a night of crazy dancing and amazing sounds! Pop punk heroes Fall Out Boy are best known for their breakthrough album From Under The Cork Tree. Released ten years ago, the double-platinum album spawned chart hits “Sugar We're Goin' Down” and “Dance, Dance” and launched Fall Out Boy into the spotlight, earning them a Grammy Award nomination in 2006 for Best New Artist. This success was matched by their 2007 follow up Infinity On High, landing a number one spot on the Billboard 200 in the first week with 260,000 sales, and producing two worldwide hit singles “This Ain't a Scene, It's an Arms Race” and “Thks fr th Mmrs”. After a hiatus from 2009 – 2012 to explore respective side projects, 2013 saw the band regroup and record Save Rock and Roll, giving the band the second number one of their career and producing triple platinum top 20 single "My Songs Know What You Did in the Dark (Light Em Up)". The band's sixth studio album American Beauty/American Psycho, set for release on 20th January 2015, was preceded by platinum top 20 hit “Centuries” and looks to cement the return of Fall Out Boy!